ecisions, decisions, decisions…! Boy, did this lecture strike a familiar chord! Barry Swartz (The Paradox of Choice: Why More is Less) couldn’t have been more on-point if he’d actually looked in my pantry and seen my reaction to too many kinds of jelly on the shelf at the supermarket. My reaction? Too many kinds of jelly on my pantry shelf as well. If I’d been forced by circumstance to choose just one, I would have come home empty-handed like the folks in the study wound up doing, because the options were overwhelming. But given a debit card and ample jelly-and-jam-buying resources, I went the other way. I can slather every slice of toast in the neighborhood for months without ever having to shop…and I don’t even eat jelly. There’s the irony. I’m one of those people not only overwhelmed by options for things that I actually want and need, but give me enough options on anything, and I’ll feel forced to pick one. Or twenty. Where does this leave me in the world of horses? Well, it leaves me with a herd of horses that can’t be described in one word. I’m not a “hunter rider” or a “western rider” or any other easily-pigeonholed type. I’m not even a hoarder. I have the number of horses I need in order to do all the things that I feel I want to do, even when I don’t want to do them. I used to be the type that strikes fear into the hearts of barn owners and thrills the horse dealers. I didn't know what I wanted, so I wound up appearing a little loose around the edges. I solved the problem by resolving to never make decisions on impulse. Okay, that's a lie. I never made that resolution. I do decide--and often buy-- on impulse, but I avoid life-changing decisions and purchases of anything bigger than new shoes and medium-weight horse turnout blankets, which I buy in multiples and far too often. In truth, I've raised dithering to an art form. What I do hasn't really got a name yet. I wait for the monthly landslide of catalogs like I'm expecting to find diamonds in the mailbox. Then I sit in ritualistic rigor, hour after hour, reading descriptions of everything from pj's to saddles to jewelry and real estate, dog-earing pages, circling product numbers, and fantasizing about how this purchase or that will make my life ever so much better. Then I put the catalogs on my desk and walk away. By the next morning, I can't remember why I thought any of it was a good idea. I flip through the dog-ears. If there's something I actually meant to order--a refill on a horse supplement, for instance--I order it online. The rest land in a pile on the floor on their way to the recycling bin. Can't do that with horses. They don't recycle as easily. I've taken a Just Say No stance on those. It took hours of practice, saying that in front of a mirror, before I got good enough at it to go public. The options are just so broad, and the reasons for choosing them are even broader. So, like the people observed in the study, I freeze. Unlike them, I can sometimes thaw and make huge rash purchases that leave me wondering later. But through it all I can't help but wonder at what point will the marketing gurus figure out that we don't really need another different kind of whatever. Cell phone/nose hair trimmer/creme brulee torch? Hoof pick/flashlight/keychain/MP3 player? We are becoming a society of maximizers, always looking for the Next Big Thing and living in a constant state of regret, because nothing we've already done can possibly be as good at the choices in front of us or the ones we let get away. And according to Zip, we're freaking out our horses. Zip has become flinchy every time I reach for my latest grooming product "must-have". ME: Check this out! It's going to make your tail grow six inches by the end of the month! 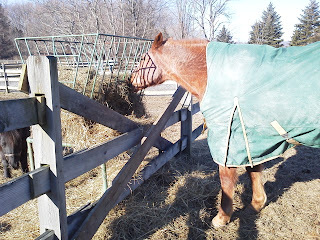 ZIP: It smells like something I'm gonna have to roll in manure in the pasture to get rid of. ME: Look at the cool applicator bottle! It's got little sunshines all over it and it glitters. It has to be super-great if it's in a glitter bottle. So it goes. There will always be another "best" halter, horse, partner, hair style, fad food. Maybe it's okay to let a few slide on by and focus on why we have the things we've already got....like this super-nifty massager/letter opener/pencil sharpener I just found in my bottom drawer! Hoo-hah! his is a fun video no matter who you are. Believe me, I didn’t insert it for its religious significance, though it does have its share. Living healthy isn't for the meek, and A. J. Jacobs puts a hilarious spin on how far we can take things if we let ourselves get lost in the conventional wisdom and News About Your Hair: Is Air the New Dioxin? We live, Jacobs says, in a noisy world (I, for one, love that he cites Bill Reilly as one of the noises, but I digress...). It's noisy in more ways than one. The "too much" part of the title of this post is obvious, but the "not enough" part, maybe not so much. What I mean by that is that there's far too much of everything else--noise, news, social rules, fashion up-and-downgrades--and not nearly enough of the truth. Facts are in short supply these days. Sources rush to the starting gate the minute they think they might have something to warn us about that will boost their ratings. Who among us hasn't DVR'd the late-night news because the morning blurb said something tantalizing about Uranium in our corn flakes or the impending "baby bump" on the front of some Starlet somewhere? Okay, maybe not the latter, but certainly the former is going to catch the attention of the masses long before the Noted Scientists involved have finished dotting the last i on the last page of their report. Just last week the Fungicide In Your Orange Juice thing lasted a full 12 hours before it was reduced to a sound byte in the face of questionable actual evidence. So we have too much of not enough information, and that applies to all parts of our culture, including the horse industry. My first boarder had so much input from so many sources, for instance, that before I'd learned to use my NO! with authority, I'd bought five different kinds of grain and gone through the laborious switch-over process five times. What she (and I) didn't have was enough real information. What else do we have too much of not enough of? Has there been a time lately when you were on the giving or receiving end of an "explanation" for bad behavior that just made your head spin? There are so many variations on this theme, it's mind-boggling. Did someone kind of skirt the law because it seemed easier, then rant about how they were forced into that position? Did you explain to your neighbor that your horses keep wandering into his Elegant Landscape Water Feature because it's too close the fence you keep forgetting to repair and the empty troughs you keep forgetting to fill? Did you send a note to school explaining how the pony ate your kid's homework? Did you buy or adopt a horse (or anything else) you can't afford, and did multiply the insult by begging for money to support your bad habit? Did you say you'd pick up your daughter after soccer practice and forget? Did your barn sitter neglect to check the buckets before dumping a scoop of grain on top of a manure deposit left from the night before? Did you mean to call the farrier and change your appointment and forget? Did you leave him to find, catch, and shoe your lunatic gelding by himself? Are you neglecting a horse (or anything else) you bought or adopted that you can't take care of? How often do you spin the truth to avoid looking bad? "Oh, his ribs were sticking out like that when he got here" is a scant excuse after five years. "No, I don't know what happened to your ____________." Really, or are you just afraid to admit that you borrowed it and broke it? "I hope you win your class!" sounds really good only if you're not gritting your teeth and poking the friend standing next to you so she won't miss your eye-roll. "We're a horse rescue" has to be applied to actual horse rescues, not the faux variety. "Nice horse!" only applies to nice horses. Did you go all sappy over a down-on-his-luck horse (or anything else) and take it home without mentioning that said home is in foreclosure? This is a big one. Integrity is the sum of all the above-noted parts. If you have too much of not enough of any of them, you're going to get gonged. An honest, reliable, responsible person has integrity. If any of those parts is missing, then you get a big zero on the Integrity Quotient scale. There's no partial credit. No make-up test. No option for a discount. There is, however, the chance to rebuild yourself. Like A. J. Jacobs' Year of Healthy Living, we can all launch a Year of Living With Integrity. That may mean ignoring the "news" and passing up conventional wisdom for the real thing. It may mean that sometimes the path won't be clear and your motivation will be less than stellar. It might mean some hard work to toe a line you'd rather pretend doesn't exist. But it may also mean that this time next year you'll be able to look at yourself with new pride and without holding up a pillow and glowering through the fringes. If nothing else, it may give you a funny story that you can put in a video for posterity. Lover, Rider, Owner, Caretaker.. Who Are You? met a nice, shiny-new horsewoman the other day when she came to my farm to pick up something I was “freecycling”. We talked for a bit about what we were each doing with our farms, and she made the comment that she had quickly gotten tired of the boarding business when the first horse person dropped off the first horse at her barn and not one board payment ensued. There’s a legal process here for dealing with that situation, and it doesn’t benefit the barn owner in any way. She said something to the effect that these people (and the folks who made the legal process of dealing with them so onerous) didn’t get what it takes to take care of a horse. That got me thinking. There are, I’m positing, five levels of horse involvement. Horse lovers are wonderful people who may or may not have ever actually touched, smelled, or been run over or dragged by an equine of any description. They love horses mostly from a distance. They love horse-centered movies, horse-themed décor, horse farms dotting the landscape, books featuring horses, but have probably never had the full-immersion Equi-sperience. These people are a danger mostly to themselves. They’re the ones who will be likely to donate to spurious charities and write letters to Congress. We need them for their letter-writing skills and because they buy our books and our art, we just need to aim them properly. This includes adults who loved pony rides as kids, people taking lessons on lesson horses, and those who used to ride but don’t anymore because something happened to end the fantasy…like contact with Real Life. If you get on a horse astride, aside, or abaft (I’m borrowing that nautical term to refer to riding behind a horse in a carriage or sled, or covering ground at the end of a rope after an ill-fated “ground driving” effort—those folks need love too), you’re an official Horse Rider, as it tends to be called on insurance forms. We need you because without you and your dreams, the rest of us would have nothing to do all day. Anyone who has now or ever paid for or adopted an equid of any kind can join this group. Even if you share a horse with three other people, you’re welcome. It’s the owners who pay the freight for the rest of the clan, so we definitely need them. Not all owners are created equal, however. The one who dropped the horse at my new friend’s barn and never came back is a Bad Owner. The ones who get their horses shod and vaccinated and make sure they’re in safe environments and pay their bills are Good Owners. It’s a spectrum. If you own a farm, have horses in the backyard, or work somewhere mucking stalls, this is your group. These are the least-understood, most-maligned of horse people. The first three groups may think they know about horses, but until you’ve been up all night keeping watch over a barn roof during a blizzard, you don’t know about horses. You don’t really know about bedding, feed, hay, or brands of stall fans until you’ve run up a tab buying them and tossing them out. And you don’t know what it means to dump your horse at “the barn” while you go on vacation until you’ve had a sleepless night or two listening to odd noises that could be predators in the pasture or thieves in the night coming for the dumpees. These are the true Foot Soldiers of the business. We are necessary, and we are to be commended. Without us, your horses would be living in your garage and everything you own would smell like horse, which sounds lovely in small, controlled whiffs, but not as a full-time affair. If you do anything else with horses from brokering them, to shipping them, to slaughtering them, to shoeing them, to giving lessons and training them, to disposing of carcasses, to looking up their noses with your cute little flashlights and sticking needles in them, this is where you belong. You are the moons that control the tides of the horse business. Sometimes you’re the rocky shoal against which we crash. But you are ultimately important to the horse world. Keep that in mind, know we appreciate you, and be careful how you roll. You have the power to sink us. So, who are you? And how much do you know about the other horse people in the other groups? And are you willing to learn? hen better to think through all the problems you had during the last nine months than while you’re waiting for the snow thrower to upchuck you dog’s squeaky toy? While my toes were thawing this morning I realized that I’ve been very creative of late. Sometimes time off from riding leads to actual coherent thought. Before I go on about myself (as I so love to do), click the link above. This site by, for, and about grooms and grooming issues is a must-see. Your input is requested there to help with their 2012 planning, so jump on in! They are rubber boots by Bogs©. Those laces are only for appearances, so don’t be put off by them. These are the bestest pull-on/stomp-into boots I’ve found, and I really didn’t think anything would outdo my Uggs© fleece-lined rubbers rain boots. The Bogs are lined with some sort of knit fabric with a layer of neoprene foam insulation under it. They fit like a glove, are comfy as all get-out, have aggressively ribbed soles, and I even wore them for riding in a western saddle with great success. I wouldn't recommend them in English stirrups as too-aggressive tread can spell unplanned horizontal girth and footing inspections. I know Bogs makes taller boots too, but with the barn only a couple of hundred feet from the house, barring deep snow, I only needed something above-ankle height, and these do well under jeans where my tall, insulated Muck Boots make a pile of my pants legs. 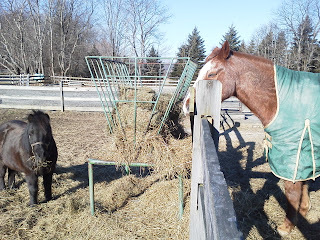 My second Helpful Horse-keeping Hint is a solution to the Ring Around the Hay Feeder problem. You who have horses at your place have seen the game the horses play, right? It doesn’t matter how many you have, if there’s more than one horse, there’s a game afoot. They’ll be standing all innocent one minute eating hay next to each other or on opposite sides of the rack, then suddenly one will take offense to the mere existence of the other and shoot him a dirty look that sends him scurrying to the opposite side. This can go on all day every day forever. take down the top board for access! Ha! 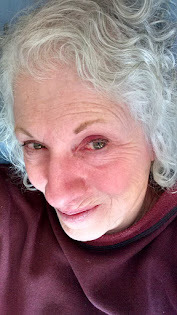 Not everyone sees it as a problem, but I was beginning to hate the deep, manure-filled gully that had appeared around the hay rack by winter's end, and I had a twinge every time one of the geriatrics was chased even a quarter way around. The old guys need their peace and quiet while they quid their hay, d’ya mind? So after 14 years of thought, this is what I came up with. Can you imagine that it took me that long? The crossed boards, by the way, are not accidental. They keep the horses from reaching to the ground on the other side of the fence and gaming the system that way by stealing their buddy’s hay. Leo had no problem teaching me that. 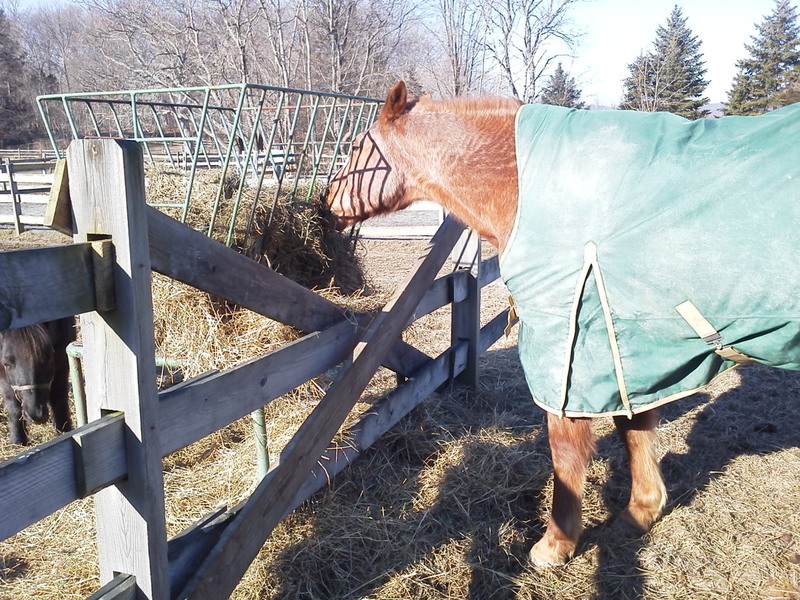 The fence in the photo surrounds a small paddock, which at this time was locked so Duke was sequestered. But I’ve found that even with the gate wide open, the horses, big or small, still sort themselves on opposite sides of the fence and no chasing at all goes on. Wah-HOO! It’s automatic, closes and opens in either direction with the lift of a finger-grip, allows the slamming shut of the gate with the back of one’s foot while one is being mugged by a horse of any size, and can be locked against accidental opening with just a stick or clip through a hole designed for that purpose. Could you just die? Where was this when I was building the place so I could have spaced all the gates properly? That’s the only drawback. It requires very specific spacing to fit and work. Note the multiple shims of varying sized between the latch and the warped fence post. Thank you. I agree I did a superb job. But it took me two hours. That wasn’t necessary. I hope you’re all putting your occasional down time to good use this winter, and I hope you’ll share some of your finds and solutions. I’m always eager to hear what other horse people are doing, if only for the comic relief. ost-Holiday doldrums have arrived at my farm. I can’t say the horses are sad that the lighted, animated deer are gone from the gardens. It’s always a kick to watch the equines watching the fake deer on the first night they notice the change, but even that gets old after a couple of days. So I, for one, am ready to move on into Political Silly Season. If you think politics and horses are strange barn-fellows, you are only scratching the tip of the manure pile. The current uproar over the restoration of funding for slaughterhouse inspectors is one of the biggest I’ve seen since…well, since the removal of funding for slaughterhouse inspectors. There are petitions galore online and elsewhere touching on that topic from both sides and addressing myriad others that are more local in nature. I’m not going to list them all. Sorry if that disappoints anyone. I'm taking the stand that "politics" has deeper meaning than just what's zipping around our heads under the guise of "reality". That's where I want to go today. This morning I posted on Facebook a video of our esteemed New Jersey Governor Chris Christie making a fool of himself and all Jerseyans at the Iowa Pre-Caucus Slam Fest. In that news clip he threatened the State of Iowa with “Jersey-style” repercussions should they fail to support his chosen candidate. It doesn’t even matter who that candidate is. What matters is that Christie is fostering a stereotype that we here in the Garden State could easily live without. All horse people are crazy. Horse lovers are basically hoarders who will consistently over-extend themselves in ridonculous ways to keep their horses. Farmers are uneducated, incoherent, shotgun-toting rednecks who should not have a say in the political arena. Emotionality rules when it comes to sorting out the mess that the horse business has created for itself. Most farmhands are illegal immigrants and horse people are fostering the illegal immigrant problem. Equestrian sports are only for the rich. I could go on, but I think everyone reading this can add to the list with more astuteness than I possess. Stereotypes are rarely a good thing. I believe it would behoove each of us to think carefully about whether or not we as individuals are perpetuating a stereotype that would be better buried with our first pony’s remains never to be ridden into a lather again. Do you scream endlessly about the problem of homeless horses (or other animals, for that matter) while you step over the homeless guy who sleeps in front of your bank? Do you have more horses than you can really care for but ample excuses for why this situation is necessary? Have you ever talked a friend into taking ownership of a horse you knew s/he wasn’t capable of maintaining? Have you bothered to educate yourself on the truth about the racing industry (or any other dark alleys in our business)? Do you make some effort to be involved in local politics in realms that don’t directly affect agribusiness and the horse world? When was the last time you caught yourself speaking loudly (that always helps) or in Spanglish to your neighbor’s barn hand? Have you “signed” and forwarded more than two online petitions in the past month without checking the details or considering the repercussions? On that last, about horses and money going hand-in-hand, well, that's a little hard to argue against. Either that's just a statement of fact, or perhaps some stereotypes really do serve a purpose as more and more horse owners find themselves over their heads in debt in an effort to prove the belief wrong. This morning I’m smarting over the whole “Jersey-style” thing. I can’t handle another stereotype that I need to fight. To be a Jerseyan is trouble enough. To be Jersey horseman with all the nonsense that’s become attached to both designations is more than I want to deal with before my morning coffee. So I’m asking that all of us horsemen think twice about the kind of example we’re setting. Christie makes New Jersey sound like a haven for the brow-ridge boys. What are you making Horseman sound like? If you can do better, I hope you will. Keep your horses, but keep them properly and responsibly without putting an untenable financial burden on yourself and your family. 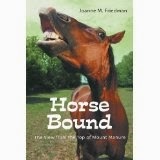 Reach out and mentor newcomers who might be strong of heart but weak of mind when it comes to the business of horses. Work within the system for the changes you want to see. Make the title “Horseman” mean something that dispels all of the stereotypical BS we’ve come to hate. It’s up to each of us to husband our own space on the planet. Do so with true Horseman's flair and an eye to the future. It sure can't hurt.